With 45 minutes still remaining till game time, it was already clear the 100th battle of the Eddy County War was to be witnessed by a healthy amount of football-hungry fans. By the time the Bulldogs and Cavemen took the field for the opening kick, “healthy” had become an understatement. They came for the rivalry, 89 years in the making. They came for the unusual excitement of a season opener between Artesia and Carlsbad, something the communities hadn’t seen since 1930. They came to celebrate the return of football, to enjoy the mild weather under the stadium lights, and, most importantly, to urge their teams on at the start of a new campaign. An estimated 8,000 strong made themselves heard Friday, spilling out of the stands and ringing the Bowl from end zone to end zone. It was a heady atmosphere for a high-school athlete. And the Bulldogs ensured the Sea of Orange was heard above the rest. 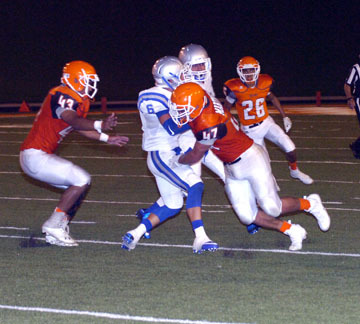 Artesia kicked off its 2016 season Friday with a solid 30-14 win over their county rivals. The offense built the necessary gap between themselves and the Cavemen in the opening half, and the Orange Crush defense delivered time and again to hold Carlsbad to just a single second-half touchdown via the traditional drive. When the cannon smoke had cleared, there was little left to be desired from an opening ballgame. 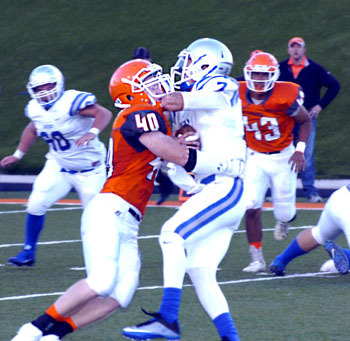 “We were really pleased with what we saw out of the Bulldogs last night,” head coach Rex Henderson said Saturday. “We felt like we came out and did the things we had set out to do. After winning the toss, the ‘Dogs quickly got the ball moving in their inaugural offensive series of the year, with junior quarterback Taylor Null working through a variety of receivers en route to the Caveman red zone. There, on first down at the 15, he connected for the third time on the drive with slot back Ethan Duff for the score with 8:18 remaining in the first quarter. 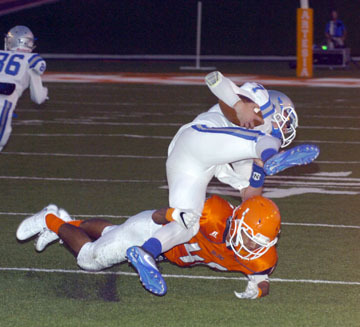 A sack of Carlsbad quarterback Jonah Leyva for a loss of 10 by every QB’s recurring nightmare, Codey Scott, in the Cavemen’s opening series helped force a punt, and after Artesia responded in kind, the Cavemen would turn the ball over on downs following another Scott sack as the game moved into the second. The offense secured a first down at the Carlsbad 34 on a 15-yard scamper by Ryan Gallegos but would briefly hit a wall. On fourth down from the 30, however, Null found a way over, hitting Chaney Hardt for the score to make it 13-0 after the failed conversion with 11:49 left in the half. Another Caveman punt had the ‘Dogs firmly in control of the momentum, but a misstep from their own eight-yard line saw a pass deflected into the hands of Carlsbad linebacker Genarro Flores. Workhorse RB Dominic Rodriguez would score easily from there to give the Cavemen the break they’d been seeking, 13-7. As they did on the opening kick, Carlsbad opted for the onside, which was handled deftly by Miguel Martinez, and the Bulldogs wasted no time taking advantage of the short field. 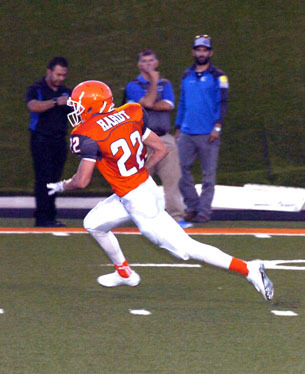 An 11-yard run by Gallegos was followed by a 10-yard toss from Null to David Barlow, and the junior QB once again made good from the Carlsbad 30, this time finding Duff to put Artesia back up 20-7 with 7:30 on the clock. marching orders, forcing the turnover on downs to wrap up the half. Carlsbad exited its locker room for the third quarter with fresh determination, however, mixing the rushing talents of Rodriguez, Leyva, Jaykan Willis and Tyler Gonzales into a 17-play, 69-yard plod that chewed 10 minutes and 13 seconds off the clock and culminated in a four-yard TD by Rodriguez. And, trailing by just six, 20-14, with 1:46 to go in the third, the Cavemen’s onside attempts finally paid off. Carlsbad recovered the fumble at their own 40 and, as the fourth quarter began, secured a first down at the Artesia 14 on Leyva’s first passing attempt of the half – fifth of the game. The 33-yarder to Willis had the fans in blue on their feet, but the Crush would rise to the occasion yet again, forcing the TOD at their own 11. A gutsy 18-yard run by Robert Fernandez to give the Bulldog offense some breathing room pushed the ball near midfield, and from there, Null connected twice with Cody Fuentes and once with Dominic Madrid to breach the red zone. A 15-yard dash by Isaiah Weideman took the ‘Dogs to the seven, but an unsportsmanlike conduct penalty effectively stalled the drive. 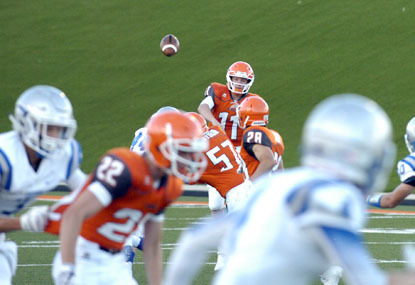 Artesia opted instead for a 25-yard field goal attempt by Tanner Harris, who delivered to make it 23-14 with 5:54 left in the game. Leyva broke a 21-yard run to take Carlsbad across midfield, but his ninth aerial attempt of the night proved costly, as Bulldog linebacker Jorge Avitia took a break from laying out running backs to add an interception to his resume, returning it 20 yards to the Caveman 40. From there, Fernandez took a Null pass 44 yards to the two and Weideman barreled in to round out the final, 30-14. Carlsbad spent the bulk of the game’s final minutes attempting to air out a comeback, but Leyva was dropped twice in the series by backer Bon Eric Trujillo for a combined loss of 22 yards, and an incomplete pass ended the threat. “It was different having Carlsbad at the beginning of the year, but this was a really good first game for us,” Henderson said. “They made us have to work, and I thought they were a much-improved Carlsbad team from what we faced a year ago. 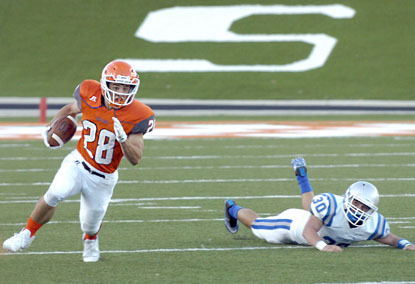 The Cavemen outrushed Artesia 203-100 on the night while the ‘Dogs had the upper hand in the passing department, 219-103. Null finished his night 17 of 30 for 219 yards and three touchdowns, with the receiving corps led by Duff, 5-60, Fernandez, 1-43, Hardt, 3-41, and Madrid, 1-31. Null also legged out 30 yards, and Gallegos and Weideman were 3-28 and 4-24 respectively on the ground. Rodriguez led the Cavemen’s rushing game with 19 carries for 107 yards, and Leyva was five of 15 for 103 yards passing. “I was really pretty pleased with our offense, as well,” Henderson said. “You have an image in your mind as a coach, and usually, you don’t quite get there in the first game. Not everything was perfect, but we did quite a few things well for an opening game, and we picked up some things on the line that sometimes it takes us several weeks into the season to pick up. With a 1-0 start under their belt and the county rivalry behind them, the Bulldogs will now prepare for their traditional Week Two game against Hobbs on the road. 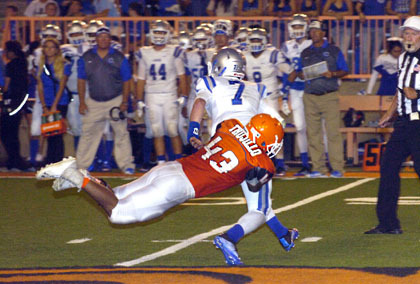 The Class 6A Eagles fell to Clovis 46-10 Friday. And while the setting will likely be a bit tamer at Watson Stadium, what the Bulldogs began in the War will no doubt serve them well as their season progresses. “I don’t know if you can really top that the rest of the season in terms of atmosphere,” Henderson said. “I know Artesians will continue to come out and support us, and we really appreciate them for being there and making for a great atmosphere, but I don’t know that we’ll have another team that travels like that.